THANK YOU for the support provided by The BJF that enabled me to participate in a wonderfully successful surgical mission in Esmeraldas, Ecuador. This was my 12th mission to this tiny country with The Ecuadent Foundation. Our surgical team consisted of approximately 22 medical volunteers, recruited from medical centers throughout the U.S. Our team met in Guayaquil, Ecuador on February 3, 2011, and departed Guayaquil the next morning on an Ecuadorian Naval aircraft to Esmeraldas, a town of approximately 200,000 in the northwest region of the country. After arrival we established our mobile hospital unit at the Ecuadorian Naval Hospital. Our surgeons triaged approximately 100 children; selecting 41 surgical patients, all requiring surgical repairs of cleft lips, cleft palates, and revisions of burn contractures. Our patients and their families had been transported from remote regions of Ecuador by the Ecuadorian Navy prior to our arrival; most having never seen a physician. 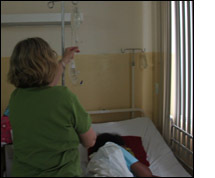 One of our patients was a child accompanied by her father, a 40 year old man. He had traveled 100 miles to Esmeraldas for his daughter's hopeful chance for the surgical correction of her cleft palate. We repaired his daughter's cleft palate as well as his huge, never repaired cleft palate. He was ecstatic. His new potential for clearer speech would perhaps afford him a job. That was a tremendous day for of us! Not surprisingly, this experience continues to enrich my life both personally and professionally. Our days in country are long, our nursing assessments must be top notch (we lack monitoring devices that we are accustomed to in the states) our collaborations are intense, our fellowships are endearing, and our outcomes are near perfect. We travel home to the states with a profound sense of having accomplished something truly vital; we know our contribution was essential and important. Our success continues because of the dedication of like minded medical professionals and the support provided to us by The Benjamin Josephson Foundation. Thanks for helping our initiatives come to life!